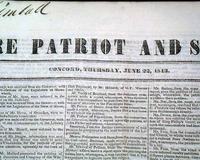 The front page has: Mr. Adams's Report On The Veto Message, signed in type: John Quincy Adams, and by several others. 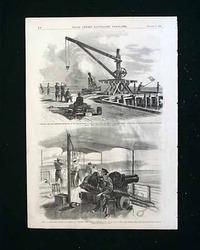 Other news of the day includes: "A Tornado" "Naval Court Martial" "The Cunard Steamers" and more. 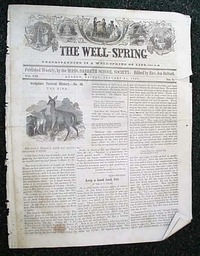 THE WELL-SPRING, Boston, Oct. 4, 1844 A tabloid-size paper with 4 pages: "Published Weekly, By The Massachusetts Sabbath School Society", as stated in the masthead. Religious content for Sunday school children. Nice masthead has 5 spiritual-like woodcuts. Some foxing & minor edge tears. 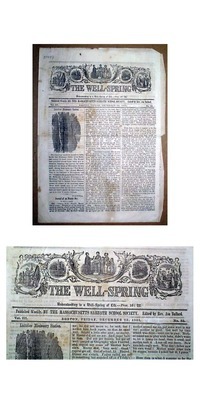 THE WELL-SPRING, Boston, Nov. 28, 1845 A tabloid-size paper with 4 pages: "Published Weekly, By The Massachusetts Sabbath School Society", as stated in the masthead. Religious content for Sunday school children. Nice masthead has 5 spiritual-like woodcuts. Some foxing & minor edge tears. 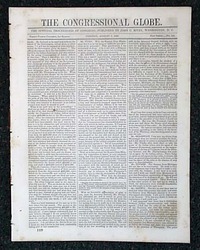 WESTERN LITERARY MESSENGER, Buffalo, New York, February 27, 1847 Subtitled: "A Family Magazine of Literature, Science, Art, Morality, and General Intelligence." 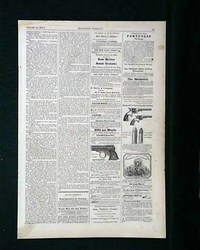 Although primarily a literary publication, there are various news items at the back. 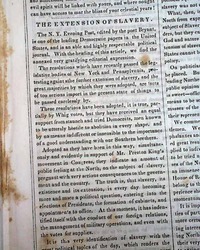 Most of one of the inside pages is taken up with: "The Extension of Slavery" (see). UNITED STATES AND TRUE AMERICAN, Phila., Mar. 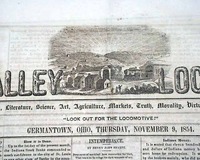 10, 1848 Has numerous ads, and a very ornate woodcut in the masthead. Piece missing at the lower left corner affects each leaf, otherwise good. 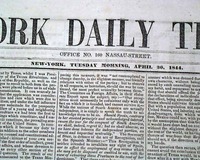 SUPPLEMENT TO N.Y. TRIBUNE, May 13, 1848 Singlesheet issue. 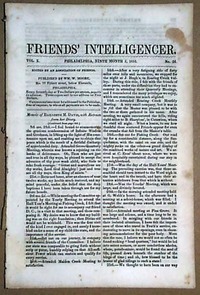 FRIEND'S INTELLIGENCER, Philadelphia, Pennsylvania, 1853. 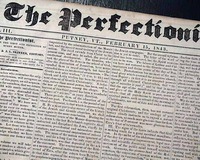 A Quaker magazine with a wide variety of content. Note that the photo is "generic" and the issue you get will not have this specific date but will have the format as shown. Sixteen pages with occasional foxing measuring 10x7 inches. 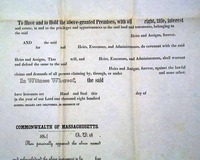 An interesting "Quite-Claim" document, printed but never used so not dated on the front save for the printed portions as seen in the photos below, although curiously there is a date on the reverse of 1854. Measures about 8 1/2 by 14 inches, very nice condition. 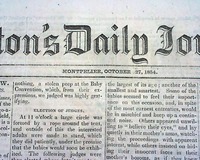 WALTONS DAILY JOURNAL, Montpelier, Vt., Oct. 27, 1854 Taking all of the ftpg. is a report: "National Baby Show" "Young America In Arms". Pg. 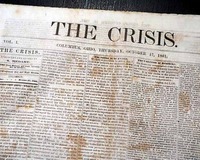 2 report: "Additional Particulars Concerning The Fate Of Sir John Franklin And His Companions". 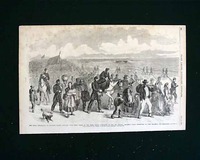 Small folio-size, in good condition. 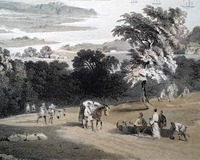 PLEASE NOTE: The exact title and date of this lithograph is unknown. This is a tinted lithograph entitled "View of Sangre De Cristo Pass - Looking Northeast from Camp North of Summit, Aug. 11th". The size is approximately 11.5 by 8.5 inches. PLEASE NOTE: The exact title and date of this lithograph is unknown. 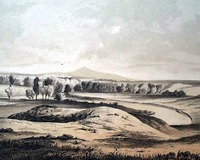 This is a tinted lithograph entitled "Milk River - Bear's Paw Mountain in Distance". The size is approximately 11.5 by 8.25 inches. PLEASE NOTE: The exact title and date of this lithograph is unknown. 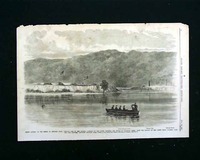 This is a tinted lithograph entitled "View of Ordinary Lateral Ravines on Grand River from Camp September 8". PLEASE NOTE: The exact title and date of this lithograph is unknown. 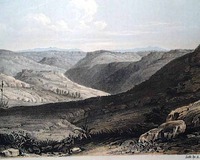 This is a tinted lithograph entitled "Rock Hills Between Green and White Rivers - Oct. 3rd Wahsatch Mountains in the distance". PLEASE NOTE: The exact title and date of this lithograph is unknown. 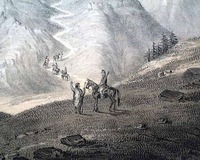 This is a tinted lithograph entitled "Summit of the Nearest Ridge South of Grand River - Traversed in passing around lateral Canones 12 O'clock, September 12". The size is approximately 11.5 by 8.5 inches. This print has some lite dirtiness. 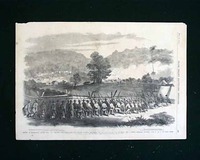 PLEASE NOTE: The exact title and date of this lithograph is unknown. 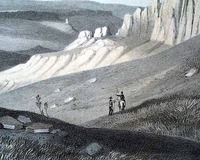 This is a tinted lithograph entitled "View of the Roan or Book Mountains". NOTED: This is showing "Lith. of Sarony, Major & Knapp. 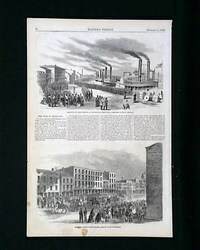 New York"
BALLOUS PICTORIAL, Dec. 8, 1855 Ftpg. illus. of: "William M. Thackeray". "Sketches in Spain" includes 7 illus. including "The Royal Palace at Madrid". Bkpg. 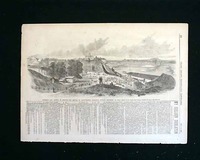 has a "General View of Newport, R.I." taking less than 1/4 pg. Text also. THE CONGRESSIONAL GLOBE, Washington, DC, 1856. 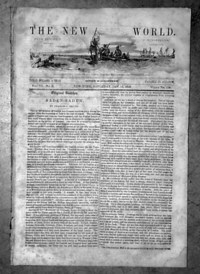 This was essentially the "Congressional Record" of the day, recording all the: "Official Proceedings of Congress" as so noted in the dateline. Note that the photo is "generic" and the issue you get will not have this specific date but will have the format as shown. Measures 12x9 inches approximately and contains 16 pages, nice condition. 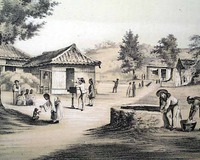 PLEASE NOTE: The exact title and date of this lithograph is unknown. 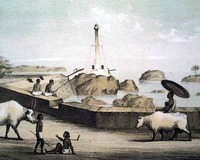 This is a tinted lithograph entitled "Light House, Point de Galle, Ceylon. 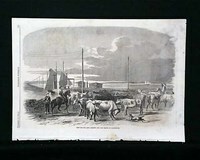 PLEASE NOTE: The exact title and date of this lithograph is unknown. 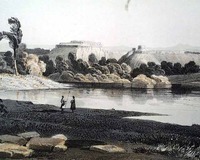 This is a tinted lithograph entitled "Temple at Tumai, Lew Chew". The size is approximately 11.5 by 8.5 inches. Please refer to the photos for more details. NOTED: This is showing "Ackerman Lith 379 Broadway N.Y."
PLEASE NOTE: The exact title and date of this lithograph is unknown. 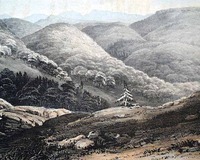 This is a tinted lithograph entitled "Napha from Bamboo Village". The size is approximately 11.5 by 8.5 inches. This print has very lite dirtiness, otherwise is in nice condition. Please refer to the photos for more details. 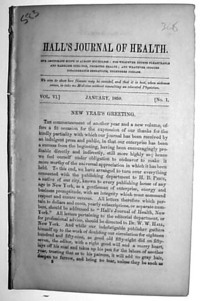 HALL'S JOURNAL OF HEALTH, New York, January, 1859 Contains tips and anecdotes for healthy living, plus various topical reports. Octavo-size, 12 pgs. browned a bit, otherwise good. 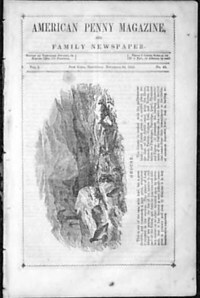 A volume I issue. 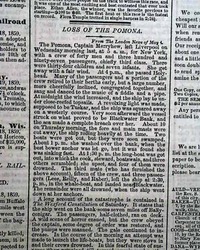 THE NEW-YORK SEMI-WEEKLY TRIBUNE, May 20, 1859 "Loss Of The Pomona" on page 5 describes the sinking of this boat that had nearly 400 passengers when it left Liverpool for New York. 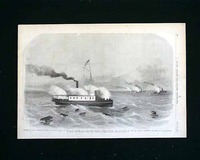 Only 3 passengers survived along with more that a dozen of the crew. 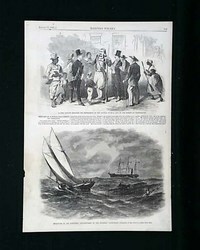 The report ends stating that "...when the vessel sank, the shrieks of those on board could be heard on the main land." 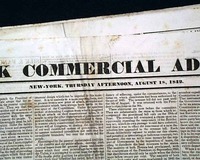 THE HOME JOURNAL, NY, Feb. 23, 1861. 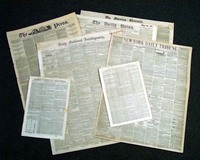 Has many topical reports, some literary content & ads. Very small hole in the second leaf, otherwise nice. 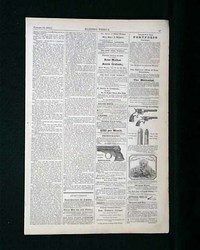 This is a single-page print. 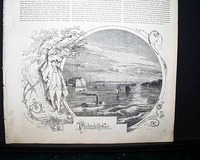 The page contains two engravings entitled "A Fire Zouave Relating His Experience of the Battle of Bull Run in the Street at Washington" and "Recapture of the Schooner 'Enchantress' by the Gun-Boat 'Albatross'". 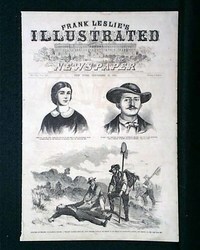 FRANK LESLIE'S ILLUSTRATED NEWS, New York, November 2, 1861 (print only) This is a single-page print. 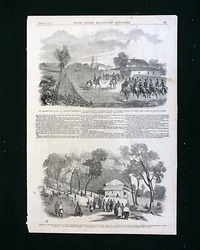 The print contains a single engraving entitled "Jefferson City, Capital of Missouri - the Arrival of Major-General Fremont's Division, September 26 - from a Sketch by our Artist with General Fremont's Division". This is a single-page print. 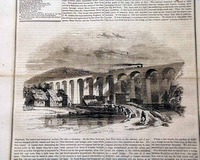 The page contains a single engraving entitled "Beef for the Army Crossing the Long Bridge at Washington". This is a single-page print. 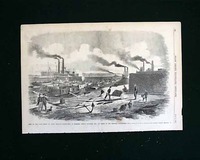 The print contains a single engraving entitled "Scene at the Upper Ferry, St. Louis, Missouri - Construction of Floating Mortar Batteries, Etc., by Order of the National Government- from a Sketch by our Special Artist with Gen. Halleck's Command". This is a single-page print. 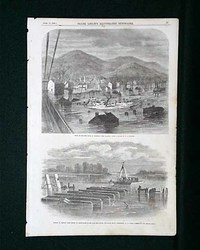 The page contains two engravings entitled "'Flood on the Ohio River at Wheeling, West Virginia" and "Sailors of Porter's Fleet taking up Obstructions in the Cape Fear River, Two Miles Below Wilmington, N. C.". See photos for details. This is a single-page print. 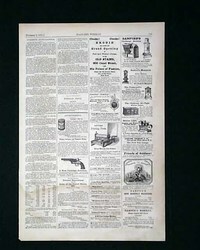 The page contains several Civil War era ads including different revolver and pistol ads. See photos for details.